Today I was finishing up making the kids' Halloween costumes for this year. While I think their costumes this year are ok, it takes me back to the year I loved their costumes. If I had my way they would be a honeybee and beehive every year, but now that they have minds of their own and my vote doesn't count. This was her first Halloween, she was about 4 months old. My daughter was a honeybee and my son was a beehive. I seriously love these costumes and wish we could repeat them every year!! My son's was definitely the hardest costume I've made so far but I would do it all over again. 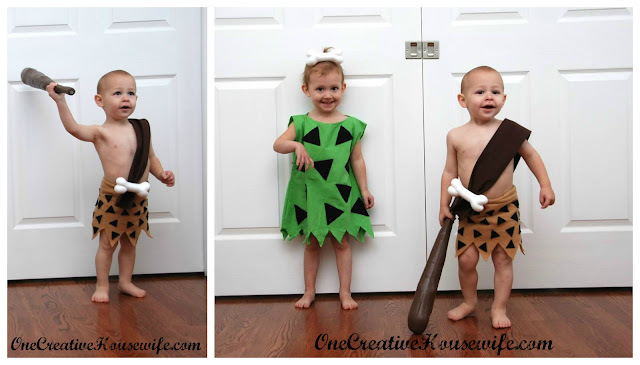 My daughter was Pebbles and my son was BamBam from the Flintstones.Don't worry I didn't send them outside like that. They wore skin-toned clothing underneath their costumes when we went out Trick-or-Treating. The kids were both Lalaloopsy dolls. My daughter was Peanut Big Top and my son was Patch Treasure Chest.